Following on from their June production of 'The Ladykillers', Oldham Coliseum are now presenting another stage adaptation of a popular film, and having never seen the film version of ‘Brassed Off’, I went to the opening performance without any preconceptions, other than knowing the story centres around a brass band in a Yorkshire mining community. ‘Brassed Off’ is certainly a lavish production, featuring ten main characters plus child support actors and a thirty-piece brass band. It is also has some stark imagery; the richness of the music and the bright band uniforms contrasting strongly with the tough and stark image of tightly-packed, red-brick terrace houses, overshadowed by the towering structure of the pithead. The mining community as a whole takes on a persona, with the Tory party seeming like an unseen demon, operating against the miners through its various agents and referred to only in passing, as a Victorian churchman might refer to the devil. Oldham’s production certainly has many entertaining performances with Racheal Garnett standing out for me, as the well-intentioned British Coal executive, finding herself with a conflict of loyalties. ‘Brassed Off’ looks sensitively at several aspects of life in a 1980’s mining community, through the eyes of wives and mothers, working miners, the retired and children. However, we only see events through a narrow perspective, as the play fails to explore the wider aspects of the strike such as the union leadership and the various political issues behind the events that took place. In the world of Grimley, everything seems to be very black and white, and almost in isolation to the rest of the country. Inevitably, relationships are strained as effects of the ’84 strike hard, often producing a dark, ironic humour. For example, a fight nearly breaks out when one miner accuses another of being a scab only to resolved when the accuser apologises, saying that he meant to just to say that other man was an ’effing, stupid idiot, receiving the reply ‘Oh! That’s more like it.’ At other times, it becomes clear that the bitterness of the strike had produced its own culture, such as when Gloria, who had effectively worked for the government, was told firmly, ‘We CAN joke about Arthur Scargill; You CAN’T’. This is all entertaining stuff but we effectively only see the end results of the strike, upon people within a close-knit community, learning very little about the real issues and events that took place to bring these about. 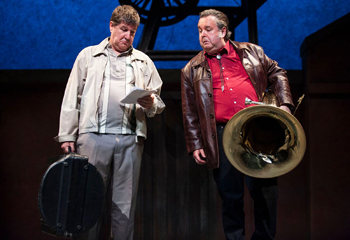 Overall, ‘Brassed off’ is a great piece of theatre, backed by some excellent music but as a play gives very much an over simplified, one-sided view of the overriding issues during a very difficult time in Britain’s history. 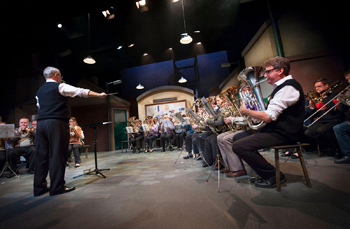 Having seen the film version of ‘Brassed Off’ in the 90’s and having lived in the pit-village of Grimethorpe myself where the story originates, I was extremely eager to see the stage version adapted by Paul Allen in the delightful surroundings of Oldham Coliseum. As with the screen-play version with Ewan McGregor and Pete Postlethwaite, our story is set in ‘Grimley’ and revolves around the members of the local colliery brass band and the imminent closure of the coal mine. Amongst quite a dark backdrop of the ‘workers’ plight against ‘Thatcher’s Britain’, British Coal and the moving trend of purchasing products and services cheaper overseas, our story is wonderfully woven with a tale of music, romance, second chances and a village fighting to hold on with pride to their past and their ‘identities’. In this stage version of the story, I was pleased to see a very tight set depicting two rows of red-brick terraced houses overshadowed by the wheel of the pit head itself. The scenery and stage area in general was extremely well utilised by moving pieces of set on and off by the cast and crew, giving it a very fluid movement from one scene to the next. Along with the visual stimulus of a great set, the audience were also treated to a feast for the ears by way of a well accomplished thirty-piece brass band that personally gave me warm and nostalgic feelings of ‘northern-pride’ (being a Yorkshire Lad myself). Throughout the moving story from pit washrooms, to home, to band practice, to the Royal Albert Hall, we see relationships under constant strain from the effects of the previous pit strikes that caused particular financial hardship on one family that is central to the story, and for others the impending vote on the future of the mine. Overall, I have to say that I was extremely impressed with the calibre of acting from the ten strong cast and child support actors and loved the way that the play captured the characterizations, motivations, feelings and emotions of all the main cast members. Particular mention has to be made to Paul Barnhill who gave a moving performance as Phil and Mr Chuckles the clown, and his ‘strong’ Northern stage wife and mum Sandra played by Natalie Grady. Also, some excellent characterizations and satirical comedy moments came in the form of John Elkington as Jim, Howard Chadwick as Harry and the romantic lead - George Brockbanks who played Andy. In support of these performances the female members of the cast also earn special mention as they really lifted the feel of a sometimes heavy script into something more fun and light-hearted, especially the two friends and wives of workers - Isabel Ford as Rita and Úna McNulty as Vera. Overall, ‘Brassed Off’ is a triumph in the stage form and sits proudly alongside the award winning film version - with great music, strong characterisations and nostalgic story telling of a Northern Village’s plight of the workers to make ‘music’ and fight the Tory ‘Hun’. It is well directed and was a treat for both myself and the audience members giving us a nostalgic ‘prod’ in the ribs – ‘lest we forget our industrialised past’, and plenty of laughs too.